In Bangladesh, farmers who adopted BRRI dhan 47, a salinity-tolerant variety reduced their “hungry period” from 6 to 2 months. Likewise, the farmers in Arakan Valley, Philippines who planted improved variety UPLRi-5 and adopted a suite of improved seed health management and other best practices had reduced their hungry months from 6-8 to 3. Reduction of hungry period is just one of the benefits of the climate-ready rice developed and tested under the project being implemented by the Consortium for Unfavourable Rice environments (CURE). Hosted and coordinated by the International Rice Research Institute (IRRI) and funded by the International Fund for Agricultural Development (IFAD), CURE’s main advocacy is to contribute to food and income security of rice farmers in harsh environments through development, testing, and adoption of climate-ready rice technologies. 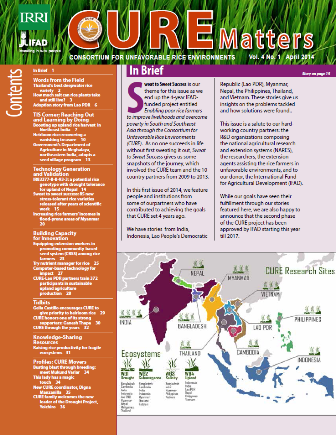 This year, CURE again took time to review its accomplishments and impact in the area of rice research and development. The 13th Review and Planning and Steering Committee Meeting was held in Danang City, Vietnam. Highlights of the meeting include ten country key representatives reporting their major accomplishments on rice varietal development and adoption from 2009 to 2013. New CURE Coordinator, Dr. Digna Manzanilla, IRRI social scientist, will lead the review and planning meeting. 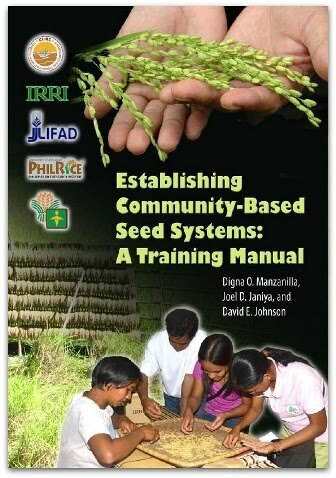 IRRI CESD director and GRiSP Program 3 Leader, Dr. David Johnson, Dr. Matthew Morell, deputy director general for research of IRRI, and Dr. Ganesh Thapa, Senior economist of IFAD will grace this event with their inspiring messages. Keynoting this occasion is Dr. Nguyen Nhu Cuong, deputy director of Sciences, Technology and Environment Department, Ministry of Agriculture and Rural Development (MARD). Countries represented include Bangladesh, Cambodia, India, Indonesia, Laos, Myanmar, Nepal, Philippines, Thailand, and Vietnam.